The fifth album from Portland-based black/folk critical darlings Agalloch is harder to immediately recommend than their previous offerings. I've spoken before about my views on the band, and it's taken me a few listens to The Serpent & The Sphere merely to unlock what's going on. It's a heavy, complex listen that can often feel rather samey, and which feels longer than the already quite long running time. Yet it is good, once you give it time to click and let those first impressions pass by. Admittedly, they're not helped by the opening track being the ten-minute epic Birth and Death of the Pillars of Creation, which is rather an obtuse choice. It's an excellent track, however; the opening rolling drums and strummed guitars grandiose enough without the choirs that soon join them. When the snarled vocals come in the song starts to sound like a particularly lush Summoning track, and there's a lovely little proggy outro instrumental section that closes it perfectly. It would be classy enough as it is, yet the band recruited Musk Ox mainman Nathanaël Larochette to compose a set of interlude neofolk pieces, which are beautiful and which really make the album feel like a work of art. From the portentous cover to the songs themselves, this is one of those records that it's really advisable to sit down and immerse yourself in, each song a mini-journey. Interestingly, it seems to be a move away from the natural focus of previous albums towards something more ethereal stylistically – remaining, however, metal of a particularly transcendental nature. 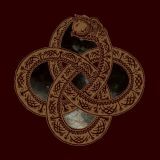 The Astral Dialogue, for example, won't be putting off any long-term Agalloch fans with its crunchy metal opening that leads into gorgeously melodic black metal, richly progressive and with a grandiose edge. Dark Matter Gods is built upon rhythmic, rumbling drums that keep the music grounded but allow moments of rage to slip loose, and Celestial Effigy explores the progressive side a little more with a foray into melodic doom territory, with typically wonderful guitar playing from Don Anderson and John Haughm (the playing from all throughout is, of course, exceptional). All excellent, then, but is this anything new from Agalloch, anything we haven't heard before? No. It's not always possible for even the most talented of bands to release a work of staggering genius every time, as much as fans may want them to. But you can't listen seriously listen to songs like Values Beyond Dimension and come away dissatisfied from this album – the skill in their crafting is clear. Plateau of the Ages, the last 'proper' track before the acoustic outro, is worth buying the album for alone in my view. It builds up slowly, post-rock influences filtering through, a strummed acoustic guitar set against backing walls of melody, exploding through in the last few minutes – twelve minutes of excellence. I can't remember Agalloch being so clearly post-rock in style (and detractors will complain heavily about it, no doubt) but they do it so damn well it's hard to complain. Despite The Serpent & The Sphere not being a classic, it's an absolutely solid dilution of the sound that the band have become known for that should please all who hear it. As Mayhem also show this week with Esoteric Warfare, not even the most legendary of bands can be revolutionaries every time, and that Agalloch have made a good album is enough for me.